As my readers and students well know, I love collecting examples of Grand Marriage: romances that are, or will be, remembered and influential for good, for generations. Some of my personal favorites include the husband-wife teams of John and Abigail Adams, Pierre and Marie Curie, Woodrow and Ellen Wilson, and Frank and Lillian Gilbreth among others. I thank God daily for these irreplaceable partnerships because I am a direct beneficiary of their devotion to one another and to the dreams they shared. In a more contemporary vein, my favorites include Paul and Julia Child and Ronald and Nancy Reagan, but that’s just the tip of the iceberg. Grand marriage, as impressive as it may sound, is not as rare as you might think. Keep your heart and eyes open, and you will start to see it everywhere: from the annals of history to today’s news to your own relatives, neighbors, and friends. One indicator to look for in a Grand Marriage (see Wife for Life: The Power to Succeed in Marriage for the many others) is a wife who is cognizant of her power to inspire her husband’s drive to achieve, as well as to protect him from his fear of failure; this is a woman who has the wherewithal to stand strong in her man’s weakest moments, to hold him tight as if she’s the proverbial last knot in his fraying rope. I call her a “Dream Keeper”. Chances are this was not the first time Dantzel had bolstered her husband in a crisis. Her husband was not, as I am sure yours is not, a one-time fixer-upper. Because a man’s confidence fluctuates throughout his life, his wife, his Dream Keeper, will repeatedly have to suit up and do battle with her man’s fears. Peaks and valleys will test the strength of his convictions. Contests between heart and fate will challenge his masculinity. The world will throw down the gauntlet again and again as if to say, Come on then, let’s see what you’re made of. Though the world may want to know what he’s made of, it’s not always about that. 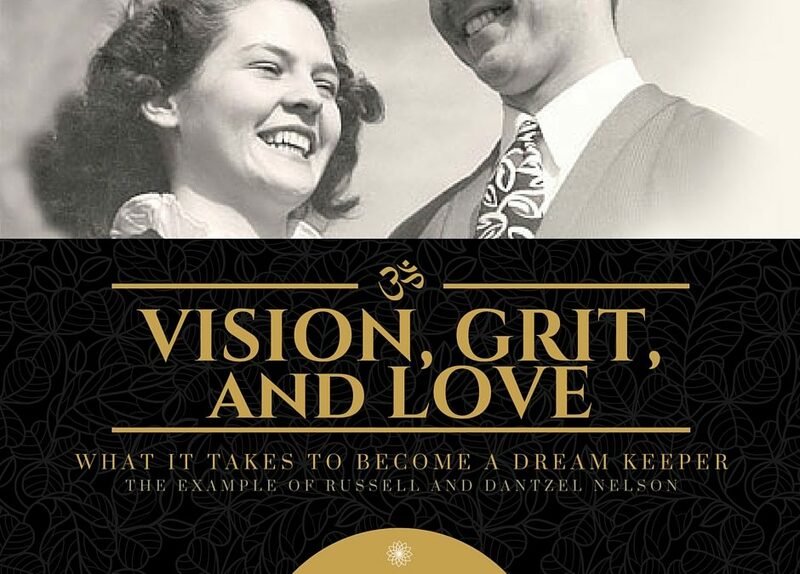 More often — in truth, in actuality — it’s what you’re made of; and what you are “made of” had better be more than sugar and snails and puppy-dog tails; it had better include the stuff of a Dantzel Nelson: Vision, Grit, and Love. Leave a comment on this post to be entered to win! All thoughtful commenters on this blog between now and 11:59m PST on the last day of the month, will be entered in a RANDOM.ORG drawing for a Date Night Giveaway (movie and a treat!). Each new comment each month (one per post please) will count as an entry. Come back and comment on multiple January 2018 posts to better your chances! So sweet to read Dantzel’s loyalty and faith in her husband’s career and ability! What an incredible companion to believe so much in her love and to rally around him when he was facing some of his lowest lows! I love this example and this post! Thank you for sharing this! Yes, Sarah, she was at her best that night. Can’t have too many to look up to, Adele! I love this story! What an inspiring woman. Thank you for sharing this now- it was just the reminder I needed today! Love to hear that it was what you needed TODAY Jenn! Loved re-reading this story again today. It is nice to read the background stories of so many great men in the public eye and to know that their success is often from their strong “Dream Keeper” wives in the background! Thanks for sharing! And visa versa Coralee! I’ll write soon about Dream WEAVERS, when a husband is the “keeper” their wife’s dream! I have thought a lot about the aspect of a wife inspiring achievement in her husband. I am on a quest right now and through this year to be that wife for my husband. And I’m with you on that quest Cathy! This is such a sweet story. We grow up with parents who have vision for the direction of our lives, and we still need someone—our spouse—to help us have vision for us after marriage. I hope to be able to help keep my husband’s dreams and support him toward his goals, despite the challenges he may face along the way. Another example I thought of that you can add to your list is William and Barbara Wilberforcd as portrayed in the film Amazing Grace. While I’m not sure how accurate the portrayal of their relationship is (though other parts of the movie are very historically accurate), I love seeing how Barbara encourages William to redouble his efforts to end the slave trade in the United Kingdom. She listens to his concerns and worries, she sees his goodness and potential, she encourages him to try again as no one else can do it like he can. It’s such a sweet example. Sarah! How wonderful! I use the Wilberforces as THE primary example of Dream Keeping in my book, Wife for Life: The Power to Succeed in Marriage. I researched their marriage in depth and you’ll be happy to know that the movie portrays the spirit of it accurately! Thank you for this wonderful and timely tribute to a great man, woman and marriage. A dream keeper is what I want to be! I’m so lucky to have a husband who is very easy going. However, it doesn’t feel like he needs much encouragement from me at all. He is not easily ruffled or stressed. He’s never had a problem getting a job where and when he’s looked. At times, I’ve been frustrated that he doesn’t seem to need me at all! I have come to realize, though, that the little boosts of encouragement and praise I do send his way, sink deep and make a difference in the way he responds to me. Hopefully, I’m doing laying a fountain so if and when a crisis does arise, he’ll be able to trust me and I will be skilled enough to be a strength to him. BriAnn, that is EXACTLY what you are doing. 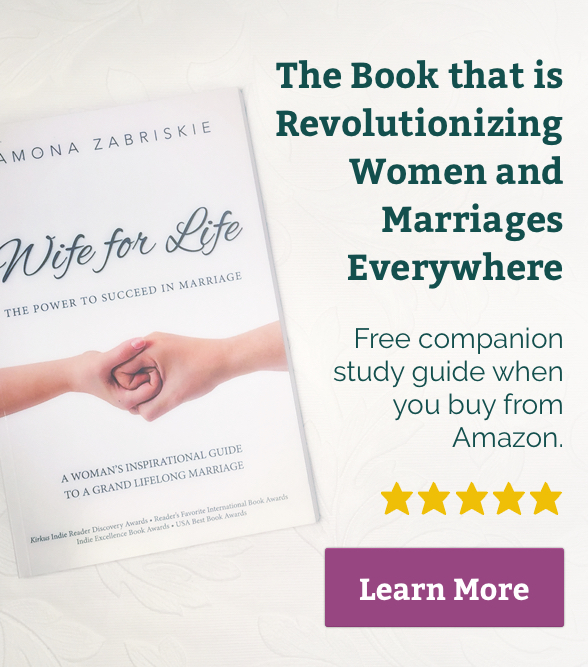 Have you read Wife for Life? I would hope to convince you there that, despite the seeming lack of evidence in your mind — HE NEEDS YOU like you can hardly imagine. What wisdom and foresight she had when making that comment to her husband. So often we would be tempted to focus on our immediate needs “you have to go to work, the kids need food and clothes” and think that our husband is somehow trying to not provide. 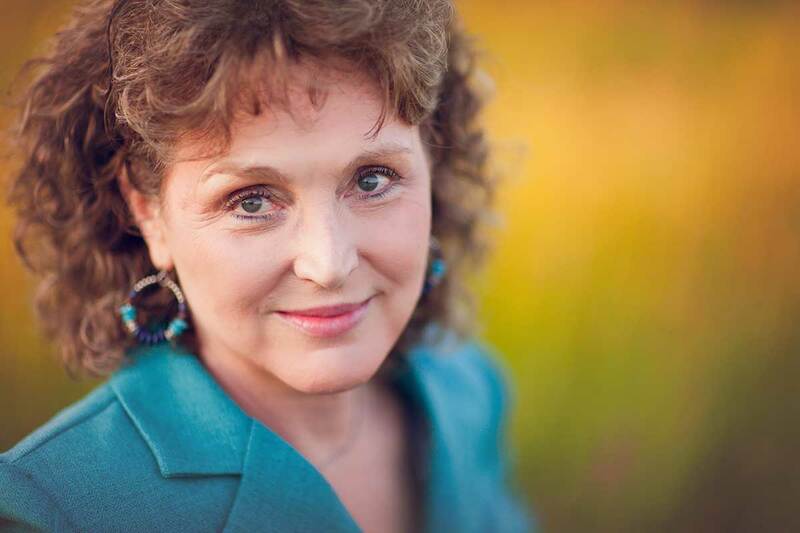 But how wonderful was Dantzel’s response of concern her husband’s progress “you need to learn more” and concern for the suffering of others, that she believed her husband could lessen. She could have become a nag, but she chose to be a support, a dream keeper. Thank you for sharing this wonderful account. You’re right, Sarah O! It did take an incredible degree of selflessness on her part to send him back into the fray — thinking WAY beyond herself. I feel such a kinship with Dantzel Nelson because I too have comforted a crying husband. I am inspired by her grit; I need that kind of grit right now! A year ago my dear husband of 38 years was diagnosed with a rare disease that claimed both his kidneys; he’s been on dialysis ever since. I’m so proud of the warrior that he is – he has continued to work full time as a professor at BYU Hawaii despite needing 15 hours of dialysis each week. I lie by his side when he comes home exhausted every day. I take his hand and tell him how much I love him. He cries that he’s not the strong energetic person he once was, and I reassure him that he is still valued and loved by everyone who knows him. As I stroke his brow, I silently admit to myself that he is not the same strong energetic man I married nearly four decades ago, but he is so much more than the man I married when i was 22 and he was 24.We have weathered so many storms together, and this is one more, perhaps the worst, but I’m not going to let this illness define him. I l tell him over and over again that he hasn’t let me down. I still see him as my warrior just in a different way. He smiles at me appreciatively as he drifts off to sleep. I lay my head on his shoulder thanking Heavenly Father that he’s still by my side. I know we can weather this storm too. Dear Kayna! I am so glad to have met you, or at least know of you through the sharing of your endearing, moving story here. It’s incomprehensible in our youth that we will, either of us, ever be susceptible to the foils and fate of this life so very far down the road. But so they come. And so they BE-come both a test of our individual character and of our relationship — the relationship we spent decades forging. What more blessed experience could there be in those times, than to KNOW our Loved One IS our Loved One still and in spite of all that life has doled us. God bless you for your role in your own beautiful story and God bless you for letting us be inspired by it. Thank you for sharing this story! I thought it was going to be about Wendy Nelson, but was very happy to read about Dantzel. My grandmother was good friends with her and often accompanied her on the piano when she sang. She had a beautiful voice. I posted about this very story today on my Facebook page b cause I love it so much. Are you LDS or is it just coinsidence that you posted this the very day he became the next Prophet of the LDS church? It is so important to watch other strong happy marriages and learn from them. Thank you for sharing this beautiful story and for encouraging women to learn by watching, or listening about other strong marriages and what makes them to be that strong. I also learn by watching marriages that struggle. I heard that you should not marry someone wanting to change them! In.my family development classes thèy say that women often marry wanting to chang the man! So how is having vision and grit possible in a way that doesn’t want to change them? Or what’s the difference between vision and wanting to change your man from your understanding, Ramona? What a great question Desie. “Acceptance” is the FIRST of the Wife for Life Laws of Attraction. There are MAJOR differences between wanting to “change” him to suit YOUR ideas, and wanting to partner with him in HIS ideas. I often say that I didn’t marry the man of MY dreams, my job is to help him become the man of HIS dreams. I see it as my great privilege to be a key part of his maturation, and that sometimes means helping him as a Dream Keeper. There is an actual skill set that goes with ALL of this, including a skill set for Dream Keeping. 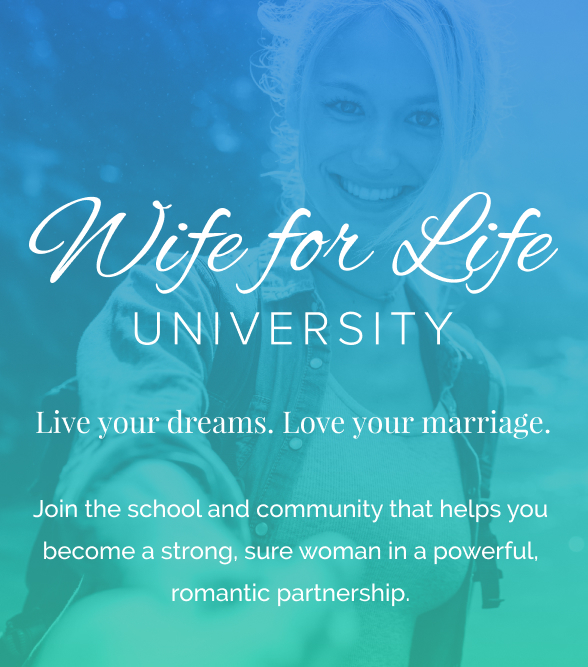 If you haven’t yet, I hope you will read Wife for Life: The Power to Succeed in Marriage, to get the full layout of the Wife for Life principles and practicum! !